Welcome to SUNNY HOUSE FAMILY Nessebar – the perfect place for your holiday! 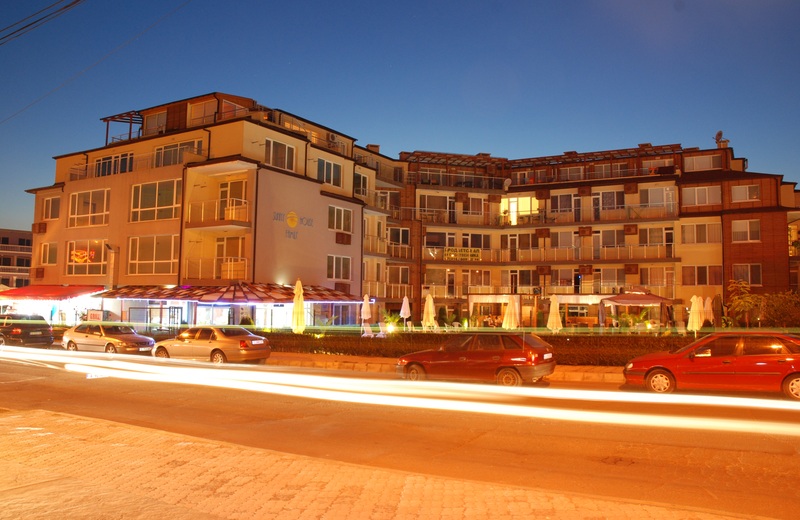 If you are looking for a place to spend your family vacation in Nessebar, a romantic weekend for the two of you, or you wish to buy a real estate property, then Apart-hotel SUNNY HOUSE FAMILY 3*** can offer you a number of apartments that would meet your requirements. Choose one of our amazing apartments and enjoy the comfort and privacy that would make you feel at home, located just 30 meters from the beach! SUNNY HOUSE FAMILY is a 3*** star hotel that offers the following amenities: outdoor swimming pool, outdoor deck chairs, pool umbrellas, tents, barbecue, open space areas that are comfortable, clean and well-maintained, parking lot, seasonal minimarket and café-bar. All apartments are equipped with air-conditioning, cable TV, oven, refrigerator, electric kettle, plates, cutlery, glasses. In addition, there are towels and bed linen. SUNNY HOUSE FAMILY 3*** is located in Nessebar, Burgas district, 2.5 km away from the ancient town of Nessebar and 4 km away from Slanchev Briag. This family complex is located 30 km North of Burgas and 25 km from the international airport of Sarafovo. SUNNY HOUSE FAMILY complex was opened in 2010. The total building area is 4500м2 and is intended as a year-round Apartment-house with a constant maintenance and staff. All apartments and studios are available for sale and part of the flats and areas that are not sold are available for rent. Copyright © 2009 - 2019 sunnyhousebg.com.